Except I forgot my floaties, and swim coach Nicole didn’t bring me any. Rude. She obviously doesn’t care if I drown on her watch. Okay, so I know how to swim in theory. I love swimming in the summer time, and by swimming I mean standing in the shallow end, staying cool in the 110 degree heat, and occasionally dunking my head under my water if I decide I’m willing to get my hair wet. OH!! And water slides!!! I LOVE water slides!! I’ve wanted to learn how to actually swim pretty much since I got my bike. I fell in love with riding right away, and it was about .5 seconds before I started dreaming about doing a triathlon. 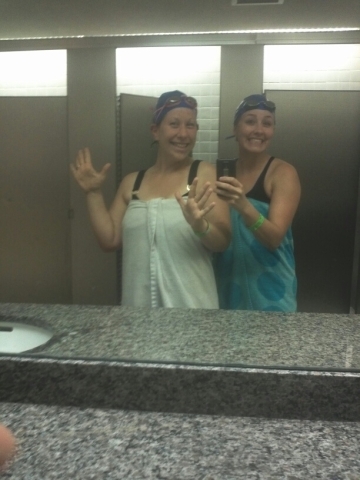 I even had one in mind to register for, but I chickened out, and the swimming has felt so intimidating to me, but yesterday I bought a cap and goggles, and went over to the Kiwanis wave pool (the waves were off, sad, that would have been fun!) with Nicole for my first lesson. Nicole was a great teacher! She was super patient, and made me feel totally comfortable while I’m sure I looked ridiculous. 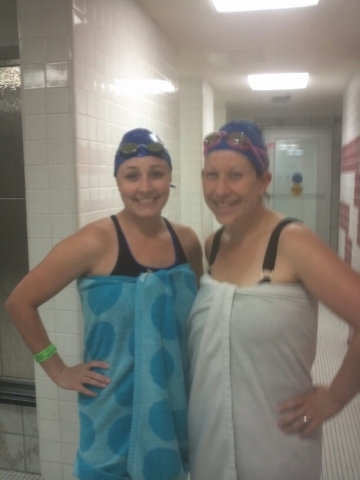 She taught me how to put on my swim cap and goggles, breathe, kick, stroke, and most importantly take awesome locker room photos. Or maybe I taught her the last one? 😉 We ended up swimming 400 yards in probably a ridiculously long amount of time, but I didn’t care! I LOVED it! Okay, let me say that this was tough. I felt ridiculously out of shape, I inhaled about a gallon of water, and I looked more like Dumbo than Ariel, but again I didn’t care in the slightest! I love the feeling of being in the water, I love the idea of a new challenge, and I love pushing myself and expanding my fitness capabilities. I loved it so much, that I am ready to shell out the money this weekend for a real fitness swim suit. Not because I want to fit in, but let’s just say mine was not cutting it, and it definitely was not a kids show in my lane. Yikes. I’ll spare you the deets. You’re welcome. Okay, I’m off track. For a change. I loved swimming! I can’t wait to do it again, and I can’t wait to take more locker room photos with Niole while the other swimmers watch us in judgement. Hi Ari! It was wonderful to meet you tonight. I will definitely check out the blogger group. Looking forward to training with you for NYC. We’re going to have a lot of fun! !